I-Berhad, developer of the i-City project in Shah Alam yesterday announced several management changes, with founder Datuk Lim Kim Hong making way for a top management team comprising a mixture of youth and experience. Tan Sri Hamad Kama Piah Che Othman, president and group chief executive of state-owned investment fund Permodalan Nasional Bhd (PNB) has been appointed as chairman of I-Berhad. Lim's eldest son, Lim Boon Siong is chief executive officer (CEO) replacing Datin Tey Siew Thuan who has been appointed as executive director. The elder Lim meanwhile has taken the role of deputy executive chairman. He said Hamad Kama Piah's appointment was the start of a new era for the group as his vast corporate expertise will further spur I-Berhad's expansion plans. "I believe that with his involvement and a strong foundation in place, I can stand back and play the role of an investor with confidence that the group will be able to meet future challenges," he said in a statement. Boon Siong has an honours degree in Business Administration from the Ivey Business School, University of West Ontario, Canada. He joined I-Berhad as deputy CEO in 2008 and is a chartered marketer with over 10 years of corporate finance and business development experience. While he manages the day-to-day operations, an exco comprising pioneering directors will focus on the strategic and corporate governance issues. "Our succession plan has the balance of youthful energy and the wisdom and experience of the pioneering team. At the same time, we have also forged strategic alliances with leading global companies," Lim said. Over the past two years, I-Berhad has managed to gain support from the various authorities for its mammoth i-City project. The project, which is already a MSC Malaysia Cybercentre is also playing a central role in making Shah Alam an International Islamic Financial Centre. It was recently conferred the International Park status by the Selangor state government, thus making it the only location in Shah Alam to have cinemas to support its cosmopolitan lifestyle environment. i-City is a RM2 billion ICT-based premier integrated commercial development spanning a 72-acre site. It has seen strong investor interest and is the only MSC Malaysia Cybercentre endorsed as a tourism destination. Among its strategic alliances are with ServCorp of Australia and the Al-Rajhi Banking Group from Saudi Arabia. Meanwhile, the group announced increased pre-tax profit and turnover for the year ended Dec 31, 2008. Its turnover grew significantly to RM95.77 million from RM4.07 million a year ago. Its pre-tax profit was also higher at RM16.15 million compared to RM1.90 million in 2007, and earnings per share rose 13.07 sen to 14.40 sen per share. At the same time, its total assets grew sharply by 38.4 per cent to RM232.22 million as at 31 December 2008. The I-Berhad board have recommended a final gross dividend of 5 per cent. The company said several factors such as reinventing itself into a property and technology player and the successful completion and sale of i-City's first phase of Cybercentre Office Suites contributed to its improved financial performance. It said 2009 promises to be an exciting year. There are plans to establish a designated bio-technology and research & development zones in i-City. Other I-Berhad's development plans are a regional shopping mall with cineplex and also a luxurious residential development in the vicinity of KLCC. SHAH ALAM: ICT-enabled property developer, I-Bhd, has appointed Permodalan Nasional Bhd (PNB) president and group chief executive Tan Sri Hamad Kama Piah Che Othman as chairman. In a statement yesterday, I-Bhd said Hamad Hama Piah took over from founder Datuk Lim Kim Hong, who had been appointed deputy executive chairman. PNB holds an 18.46% stake, comprising 19.64 million shares in I-Bhd. It promoted deputy chief executive officer Lim Boon Siong to CEO, replacing Datin Tey Siew Thuan who would be re-appointed as executive director. Boon Siong is Kim Hong’s eldest son. Kim Hong said Hamad Kama Piah’s appointment was the start of a new era for the group as his vast corporate expertise would spur expansion plans. “I believe that with his involvement and a strong foundation in place, I can stand back and play the role of an investor with confidence that the group will be able to meet future challenges,” he said. I-Bhd is undertaking its flagship project at i-City, an MSC Malaysia Cybercentre which was recently conferred the International Park Status by the Selangor state government, making it the only location in Shah Alam to have cinemas to support its cosmopolitan lifestyle environment. 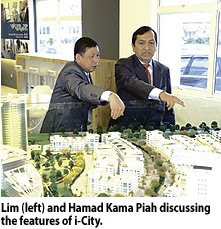 i-City is a RM2 billion ICT-based premier integrated commercial development spanning a 72-acre site in Shah Alam. Among its strategic alliances are ServCorp of Australia and the Al-Rajhi Banking Group from Saudi Arabia. There are plans to establish a designated bio-technology and research and development zones in i-City. Other I-Bhd’s development plans are a regional shopping mall with cineplex and also a luxurious residential development near KLCC. Meanwhile, I-Bhd announced a surge in net profit to RM15.32 million for the year ended Dec 31, 2008 (FY08) from RM1.94 million in FY07, mainly due to its property development activities carried out in i-City. It said the successful completion and sale of 37 cybercentre office suites from phase 1 drove its earnings. Revenue surged to RM95.76 million from RM4.06 million while basic earnings per share rose to 14.4 sen from 1.33 sen previously. It proposed a final dividend of five sen less tax. I-Bhd said several factors such as reinventing itself into a property and technology player, and the successful completion and sale of the Cybercentre Office Suites contributed to the group’s improved financial performance. Over the last 10 years the Malaysian Institute of Estate Agents (MIEA) has organised the Malaysian real estate convention and developed various themes to focus the attention of the delegates on the myriad issues that affect the real estate fraternity. This year’s MAREC 09 has been planned with a down-to-earth programme that will address the real issues affecting the profession and the way the business is operated. The theme for this year’s convention is ‘Reinventing the Profession’, which is apt and timely as practitioners can embrace new ideas to face new challenges ahead. As the old Chinese saying goes, “A good carpenter will always sharpen his saw”. So with this saying in mind, the institute encourages its members and fellow practitioners to develop themselves continually in order to remain competitive in an ever-changing world. At the end of the convention, it is hoped that practitioners would be able to reinvent not just themselves, but the profession as a whole. Previndran Singhe is the CEO of Zerin Properties and focuses on hospitality transactions in the region. He is the only Malaysian selected from among 12 winners across nine categories in the Asia Pacific region for the inaugural Real Estate, Facilities, Project (RFP) Outstanding Individuals in Industry Awards 2007 in the real estate investment category. YY Lau is the director of YY Property Solutions. With 15 years of estate agency practice, she has serviced some Fortune 500 companies and is much sought after by the press for her comments on the local real estate industry. Siva Shanker is the chief executive of Linear Estates and has more than 24 years experience in the property industry. He is currently a council member of the MIEA and was the convention chairman of MAREC 08. Having realised that negotiators play an important role in the profession, the organisers introduced the negotiators programme last year and have now made this programme a permanent feature of MAREC. The negotiators programme at the upcoming convention is expected to teach and guide negotiators on sharpening their knowledge and skills in salesmanship and negotiating. It is structured to impart technical knowledge of the workings of the industry and also to get negotiators to envision the endless possibilities this industry offers them. The highlight of this convention is when they get first-hand information on how the top producers in the fraternity made their millions. This will be done at the Million Dollar Producer’s Forum, both for the negotiators and the real estate agents. There will be three speakers each from the residential, commercial and industrial sectors who will share their thoughts in the Q & A. One of the latest topics included is ‘The Malaysia Property Incorporated or MPI’ which has been set up by the Economic Planning Unit, Ministry of Finance, to promote Malaysia as a property investment destination. The ministry has given a grant of RM25 million for this purpose. The speaker will share ideas on how estate agents can participate in this programme and how they can develop new business leads. There will also be about 20 exhibition booths that will display products that can benefit the practitioners. These include software programmes for managing listings and negotiators, property inspection and building advisory services, latest maps by Ho Chin Soon, as well as mortgage companies, banks and property magazines. At the convention, each participant will receive a free voucher which entitles him to free accommodation for a four-night stay either in Bali, Phuket or Pattaya, worth over RM3,000. All participants are also invited to participate in the Networking Cocktail Reception on Saturday evening, February 14, to celebrate Valentine’s Day. Sign up now for the Malaysian Real Estate Convention – MAREC 09, to be held on February 14 & 15. For details, please contact MIEA.